Some places just feel like home from the moment you walk through the front door. Bella Costa is a gorgeous property that captures the breezy, fresh vibe of the Georgia coast. Bella Costa is one of the rare Tybee Island vacation homes that can easily fit a whole family. It is spacious, elegant and totally welcoming! The home can accommodate a total of 10 guests between its five bedrooms and four bathrooms. It boasts a full 3,200 square feet of space to enjoy in total. Of course, it's the views offered by Bella Costa that make it stand out as one of the best Tybee vacation rentals available. The property famously features an outdoor deck and a separate sitting area that offers amazing sea views everywhere you look. Guests can sit back, relax and watch views of ships coming in all day long. The first thing anyone will want to do when they arrive at Bella Costa is to take a moment to relax on the swinging benches that adorn the property's beautiful white porch. Step inside this bright and airy property to be greeted by a spacious great room with a grand fireplace, flat-screen television, huge windows and plenty of comfortable seating. The open layout of this property boasts an elongated island that divides the kitchen area from the living room. In addition to the seating provided around the island, there is also a nice-sized dining table that is surrounded by beautiful windows. The kitchen in this home boasts new appliances, pendant lighting and cabinets with tons of storage space. Guests can make use of a fridge, oven, dishwasher, microwave, coffee maker and toaster oven. Bella Costa is a three-story property. That's great news for anyone looking around at Tybee vacation rentals for larger groups because it means guests can enjoy some peace and quiet when it's time to go to sleep. The bedrooms in this property are nothing short of elegant. They are also wonderfully spacious. 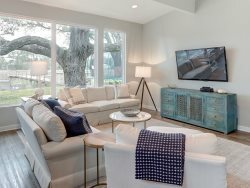 Guests can enjoy perks like large dressers, ample closet space, extra seating, flat-screen televisions, ceiling fans and large windows in the home's bedrooms. The home's master suite is a thing of beauty. This enormous suite actually takes up about half of the third floor. It features a private deck and its own bathroom. The second suite on the second floor also has its own bathroom. All of the other bedrooms are conveniently located on the home's first floor. All of the bathrooms in this home are totally updated with beautiful tiles, countertops and fixtures. This home isn't done impressing potential guests with all of its features just yet. Bella Costa has a laundry room with a washer and dryer. What's more, this room actually serves as a utility space. It's where guests will find brooms, mops, vacuums and other essentials for keeping things tidy during a stay by the beach. Bella Costa offers touches that go way beyond the basics. The hot tub here is what vacation dreams are truly made of. What's more, there's a recreational room that features a pool table. This little touch can be a lot of fun for family members and friends looking to stay busy while hanging out in this home. Guests will find parking for four cars. This is a perfect property for anyone interested in finding Tybee Island vacation homes that are extremely private. It is located in a quiet residential neighborhood. Guests can easily walk to a private beach to splash in Atlantic waves and look for playful dolphins in the distance. Bella Costa isn't just one of the most breathtaking Tybee Island vacation homes available. This property is a special place where amazing memories can be made. It is a place designed for some richly deserved rest and relaxation. It may be hard to believe that guests actually want to leave the grounds of stunning Bella Costa when they come to Tybee for vacation. However, the truth is that the gorgeous beaches and fun attractions throughout this barrier island are enough to make anyone want to get out there and seize every moment of every sun-filled day and every moon-kissed night. There is so much beauty and fun to be found at Tybee Island Beach, North Beach and South Beach. Spending some time by the Tybee Pier is a must-do activity for anyone who loves the beach. Lighthouse lovers will find joy in making voyages to the Tybee Island Lighthouse and the Cockspur Island Lighthouse. There are tons of places around Tybee where visitors can rent gear for water sports or catch chartered boating excursions. In addition, live concerts near the beach and outdoor markets on the weekends help to create a very lively vibe on the island. Bella Costa is a property that brings the dream of staying at a perfect home by the beach to life. This is simply one of the best Tybee vacation rentals for a larger travel group due to its large size, ample sleeping space and very practical layout. Of course, the way every inch of this home has been carefully designed to offer an elegant, polished look is why it's one of those vacation rentals Tybee Island GA guests all want to get their hands on. Members were very friendly and professional.